Back to basics: what are the symptoms of endometriosis? Symptoms of endometriosis can vary and you may not show any symptoms at all. The most common symptom is chronic pelvic pain which feels similar to menstrual cramps. 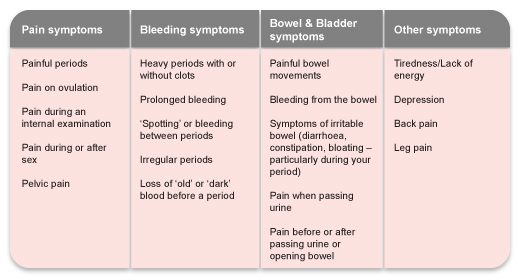 The pain often correlates to the menstrual cycle, however a woman with endometriosis may also experience pain at other times during her monthly cycle. Endometriosis is described as a chronic illness as it lasts a long time, sometimes for the rest of the affected persons life. When describing an illness, the term chronic refers to how long a person has it, not to how serious a condition is. Some women experience symptoms while others may not. The symptoms of endometriosis can vary in intensity. For many women, but not every woman, the pain of endometriosis can unfortunately be so severe and debilitating that it impacts on her life so that she may not be able to carry out normal day to day activities. Most women with endometriosis may also experience pain in the area between their hips and the tops of their legs. Another symptom of endometriosis can be infertility. It is estimated that 30-40% of women with endometriosis are sub-fertile (the condition of being less than normally fertile though still capable of effecting fertilisation). Infertility is not always caused by endometriosis - it can be due to many other factors. The amount of endometriosis does not always correspond to the amount of pain and discomfort. A small amount of endometriosis can be more painful than severe endometriosis. It depends, largely, on where the endometriosis is actually growing inside the body. All of the symptoms above may have other causes. It is important to seek medical advice to clarify the cause of any symptoms you may experience. If your symptoms change after diagnosis, it is important to discuss these changes with a medical practitioner. It is easy to attribute all your problems to endometriosis, but it may not always be the cause of your symptoms. The symptoms of endometriosis can also indicate many other conditions and because endometriosis manifests itself in a variety of ways, diagnosis can be difficult. A brilliant summary Shireen. It's so important to share as much information we can about what endometriosis is as well as how it effects us.